USDJPY is under the control of the Unemployment Rate, Household Spending y/y and Retail Sales y/y in Japan and S&P/CS Composite-20 HPI y/y and CB Consumer Confidence in US therefore the pair would act more volatile for today. 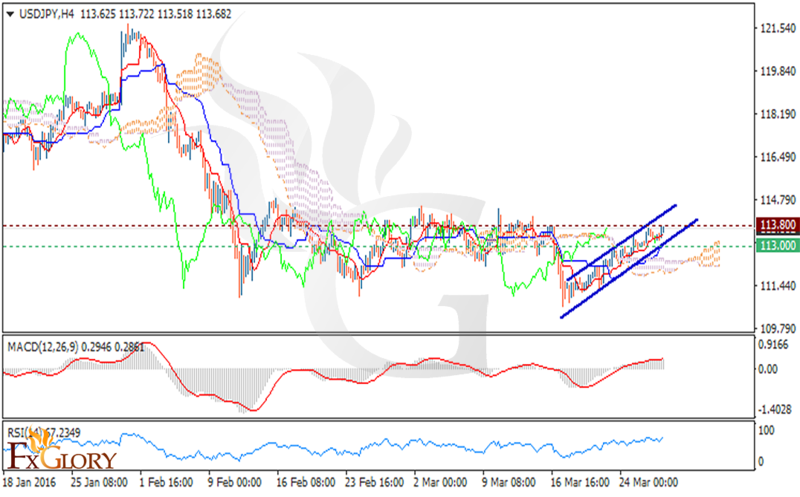 The pair had a fall yesterday and now is finding support at 113.00 with resistance at 113.80. The price is above the Ichimoku Cloud and the Chinkou Span signaling a price growth. Tenkan-sen is showing upward trend and the Kijun-sen is showing horizontal trend. The MACD indicator is in positive territory confirming the buy signal. The expected price is the resistance breakout at 113.80 otherwise it will fall to 113.00.